By 1943, the tide of World War II had started to turn against Germany. Defeated at Stalingrad, the Third Reich’s armies regrouped only to be defeated at Kursk. Elsewhere, the Germans surrendered in North Africa, met Allied invasions in Sicily and Italy, and saw their Luftwaffe and navy increasingly dominated by the Allies. The war would drag on for two more brutal years, but the end was now in sight. 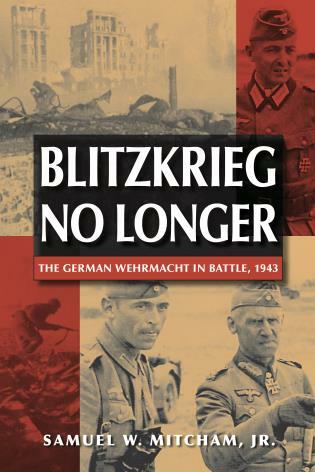 No longer could the Germans mount their feared blitzkrieg. Mitcham chronicles the turning-point year of 1943 with insight and drama. Samuel W. Mitcham Jr. is a former U.S. Army helicopter pilot. An internationally recognized authority on World War II and the Civil War, he has written numerous books, including Panzers in Winter, Rommel’s Desert War, Retreat to the Reich, The German Defeat in the East, Bust Hell Wide Open, and Vicksburg. He lives in Monroe, Louisiana.